RAVI Weighted blankets for Wellness, Therapy & Yoga. RAVI is a 8.5lb hug in a blanket – compact, portable and versatile for relaxing at home or in your yoga practice. Deepen your practice with a game changing yoga prop that is unlike traditional props. With the RAVI you will experience the heavy blanket therapeutic effects in restorative postures, additional depth and torque in YIN stretches and maximize strengthening in your movement practices. Relax & Heal & Yoga with RAVI. 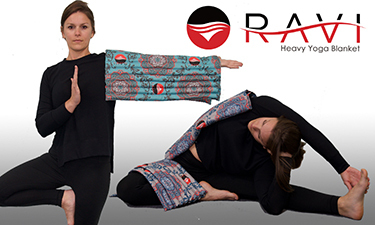 The RAVI is an innovative Heavy Yoga Prop and therapeutic Heavy Blanket all in one. See more about RAVI products here. Enter every day December 12th – 16th to increase your chances to win! RAVI calms through stimulating your sensory system. You interact with the world by sensing your environment – Sight, Sound, Smell, Taste & Touch. Placing weight on the body triggers the parasympathetic nervous system which in turn stimulates a calm internal environment. See more about their offerings on the website.